(CNN) -- Much of the nation got off to a frigid start to the workweek on Monday and below-freezing temperatures will threaten to break records in parts of the South on Tuesday morning. Hard freeze warnings were scheduled to be in effect Tuesday morning for much of northern Florida and parts of other Gulf Coast states, according to the National Weather Service. Lows could reach the teens Tuesday morning in parts of Alabama and Mississippi and the mid-20s in parts of Louisiana and northern Florida, according to the weather service. 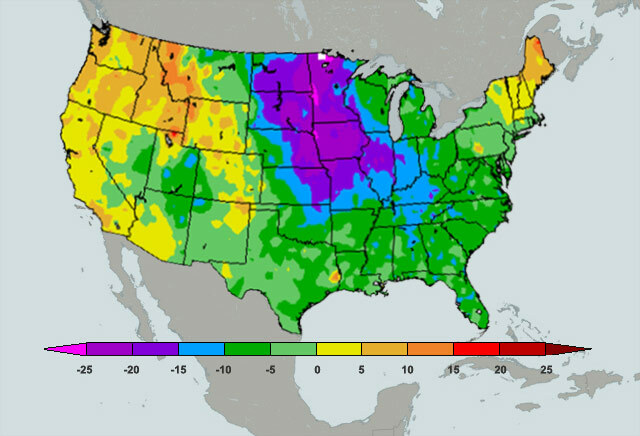 Record lows could be tied or set in those areas as well as parts of southern Georgia and Texas, CNN meteorologist Chad Myers said. Temperatures could get even colder later in the week, Myers and CNN meteorologist Sean Morris said. "More arctic air will move in this week," Morris said. "It will get progressively colder in the Southeast." The northern Plains could see wind chills of 20 to 30 degrees below zero from Monday night through Wednesday, Myers said. "Some locations could see temperatures 30 to 40 degrees below normal" on Thursday across parts of the Plains, upper Midwest and Ohio River Valley, Morris said. By Friday morning, afternoon highs will struggle to make it above zero, he said. "The main event will come whenever the reinforcing cold air moves in," Morris said. The temperature in Florence, South Carolina, got down to 14 on Sunday, Myers said, breaking the day's record low of 18 set in 1979. Temperatures in the state got as low as 16 degrees on Monday morning, with Charleston tying a record low for the day of 28 degrees, according to the weather service. In Minneapolis, Minnesota, the temperature was minus 7 Monday morning, Morris said. In Chicago, Illinois, it was 11, with a wind chill of 3 below zero. A weak storm system will move rapidly eastward across the Gulf Coast states Thursday and could bring a dusting of snow to Birmingham, Alabama, and Atlanta, Georgia, Morris said. A winter storm warning for moderate to heavy snowfall was to be in effect Monday night into Tuesday afternoon in parts of northwestern Washington state, northern Idaho, Montana and northern Wyoming, the weather service said. Moderate to heavy snowfall also is possible in much of North Dakota from Tuesday to Wednesday, the weather service said. Florida was monitoring the cold's impact on crops, especially oranges and sugar cane, according to John Cherry, spokesman for the state's Division of Emergency Management. "When temperatures get below 28 degrees," Cherry said, "and stay there for a duration of time," crop damage can occur. Florida Citrus Mutual, a trade group representing about 8,000 citrus growers in the state, said no damage was reported from Monday's weather. Some parts of the growing area near Orlando had temperatures of around 26 degrees, but not long enough for damage, said group spokesman Andrew Meadows. "It's going to get cold again [Tuesday morning]. Whether it will get down to 28 degrees [long enough to cause significant damage], I don't know, but there's some concern out there." The state, which began warning residents last week to take precautions, will continue to advise residents and visitors about the weather, Cherry said. "Statewide, we're focused on making sure people have heat, making sure people have shelter from the cold. And we're urging people to be careful with heating devices in their home," Cherry said. The cold meant more homeless people were seeking shelter, according to CNN affiliate WBIR in Knoxville, Tennessee. Two-hundred guests have shown up at Knox Area Rescue Ministries, which was built to house 100 people, according to WBIR. "When it gets this cold it means it's extra demands on what we do day-in and day-out," Rescue Ministries President Burt Rosen told WBIR. Turning to the Northeast, the Weather Service warned that a large storm off the New England coast would continue to bring heavy snow to much of New York state, including the Buffalo and Syracuse areas.